This is the guy I like to get my china LED's from. He is in California so there is little wait time (3-4 days) as he has this stuff on hand. So far his products have been 100%. I know its still china stuff but, it is in the states at least so it does not take 3-4 weeks to get. 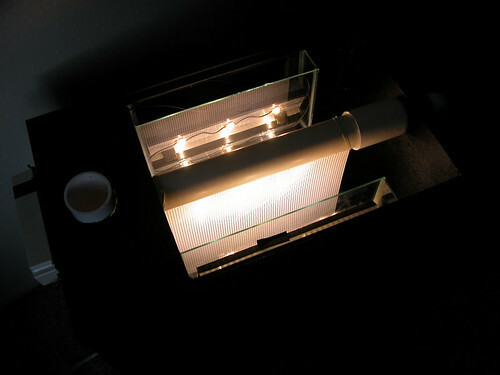 http://www.ebay.com/sch/ledtoplights...&_trksid=p5039 . Two Meanwell ELN30D-48, dimmable drivers, one for each side. Drive the LEDs at up to 625mA when full on. 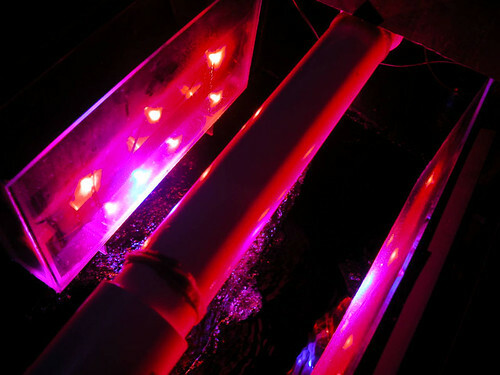 The total cost of the LEDs was something like $220, and was quite easy to do, although I built my own LED display lights, so I had some experience, and I have an BS in EE. Experimenting with intensity and photoperiod. 17 on - 7 off worked at 500mA, but burned the algae at 625mA. Currently at 12 on - 12 off at 625 mA and growth seems good, but I haven't settled on the "best" for my system yet. Growth at 17/7 and 500mA was excellent. I need to stop tinkering. Frozen mysis once per day, roughly 2-3 cubes, it depends on how big a piece breaks off the flat-pack. I prefer Hikari. Flow roughly 800 GPH. I've got a Mag 18 feeding the display, and I run the scrubber off the Herbie-style drains. Two drains, one into each end of the slotted pipe. Dimmable drivers are not necessary. A driver that runs fixed at 500mA-600mA would be fine. Forward voltage of the LEDs is only roughly 2.2v, so at 500mA, they are only running at 1.1 Watts each, and only using 15.5 Watts per side, so smaller drivers could have been used. I bought the smallest dimmable drivers I could find. Non-dimmable 18W 500mA drivers would work great. I'm having problems with growth up into the slot. Even though I have light blocker to shade the last inch of screen, it seems the light almost "channels" up the water to the slot. The growth isn't thick, but enough to cause spraying after a week or so and I have to take the screen out and clean it. I'd rather be able to go a full two weeks. I used Arctic Alumina thermal adhesive to glue the LED stars to the heatsink. For the wires between the LEDs, I used "thermostat" wire. I think it was 20 or 22 gauge solid wire. I soldered the wires to the pads on the LED stars. This isn't as hard to do as you might expect. For the wires between the power supplies and the heatsinks, I scavenged wires with male "type M" connectors from old cellphone/electronics/toy power supplies I had laying around, then bought some female "type M" connectors from Radio Shack. I drilled a hole in each heatsink to mount the female type M connector. 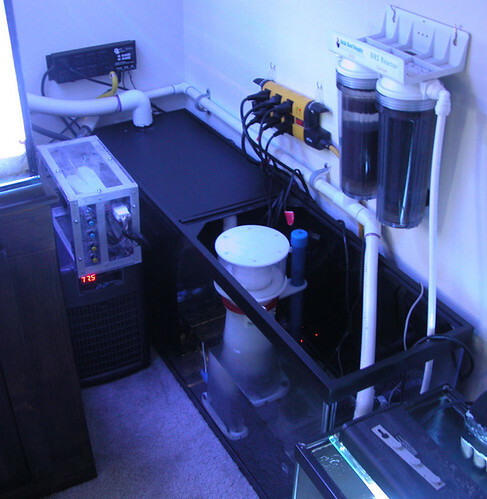 The system is a standard 125 gallon with dual back overflows. The display is lit with 126 CREE XRE leds-- 42 each of Royal Blue, White, and Blue. I recently switched to "Herbie" drains with the return coming over the back. This is a big improvement over durso drains because there is no air mixed in the flow going to the scrubber, and the whole system is now much quieter. 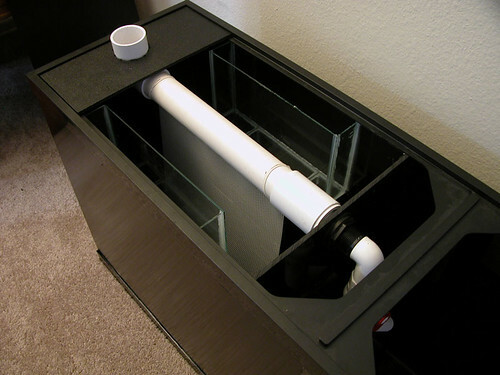 Sump is a roughly 30 gallon plastic storage bin. 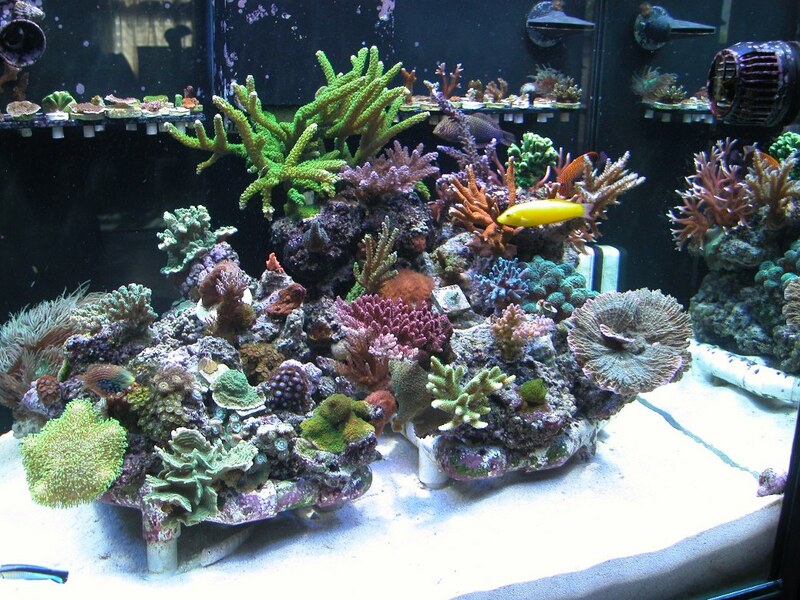 It's a "fish-mostly mixed reef", although I lost most of my SPS recently due to a big swing in Alk. I'm moving to a caclium reactor soon, off of two-part dosing. 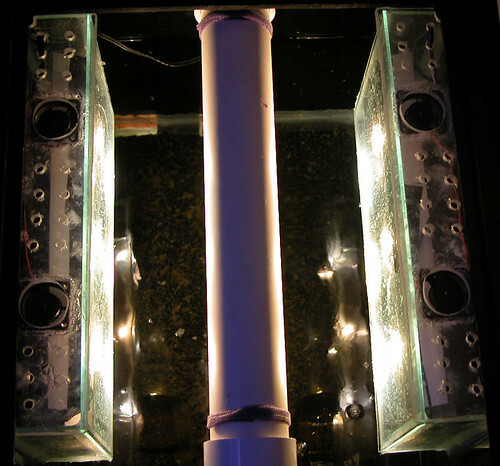 It will be interesting to see if the extra CO2 in the system affects algae growth. There could be some "synergy" there. 14 LEDs total, 7 Per side. 6x 660nm OSRAM + 1 Cree XR-E Royal Blue, run @ 700mA. Bought from www.rapidled.com. No lenses, 2.5" from screen. aluminum C channel, 10" long, 2 pieces per side, so 40" of material total. Was actually scrap from a friends DIY build but he bought it at a local metal supply company, think it was like $40 for 25', I just needed a few small pieces though. Screen Size: Standard full screen (13"x10" I believe). 2 fans over the light box enclosures (which I feel was a bad design and my next ones will not use fans). 12 on / 12 off light schedule. Flow rate around 750GPH. Feed 6 fozen cubes + enough spectrum pellets to equal another 6 cubes. Double sided. Clean 7-10 days. Growth goes from "good average green growth" to "OMG how in the world did it grow so fast!" depending on the week, seems to have an ebb and flow to the growth levels on the screens. Since my first DIY LED ATS was more "proof of concept" vs what I would consider a final product I think there are many mistakes with my build, although minor and annoying vs anything that would cause the ATS to work less efficiently. Mainly my ATS is waaay overbuilt for my size tank. My next version is going to use what I learned from this build and make it about 1/10th the size overall. So to answer what I would do differently.. pretty much everything except for what LEDs to use. I've got all LED from ebay. Thanks for the posts Morgan and Ace! That is exactly what I was looking for. Rygh, thanks for posting that. There is a cost factor and that might make some sense. I particularly like your suggestion of putting the non-reds in parallel! That's why I started this thread, to get great ideas like that. Nice build ace! I'd love a sump room but SWMBO (she who must be obeyed) would throttle me lol...Ace did you get my pms? +1 on the sizing for the food you add, not gallons. My scrubber is way over-sized. Another thing to really consider is the dual alternating screen approach. You have two screens. Left + Right. You clean only one a week. Thus each really grows for two weeks. Note: I am still a big fan of running carbon with an ATS. Without that, my water tends to get a bit yellow pretty quick.